Anyone know what this plugs onto? 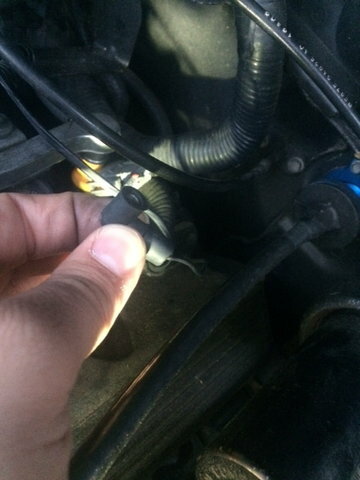 i have a 02 mustang GT and recently had the intake manifold replaced and noticed this "plug wire was unplugged and cant find what it is for and what it plugs onto.......? It's a ground for something, I forget what. Look on the fuel rail near cyl #8, there should be an exposed stud sticking up, it snaps right onto there. cars driving like crap so i hope it helps after plugging back on. I'm not very familiar with 4.6 engine wiring, but FWIW that connector reminds me of a sending unit connection, like for coolant temp or oil pressure... Is there any chance that it's not a ground? What color is the wire insulation? thanks z28\all plugged back on! So what does this SCT X-cal II thingy do? Quick Reply: What Does This Thingy plug onto??? ?